The Declaration of Santiago calls for member countries to address integration issues in infrastructure, energy, health, defense, security and crime prevention, natural disaster prevention and management’. RIO DE JANEIRO, BRAZIL – The leaders of Latin American countries met in Santiago, Chile last week are discussing the creation of Prosur, a new regional bloc to replace the Union of South American Nations (Unasur). 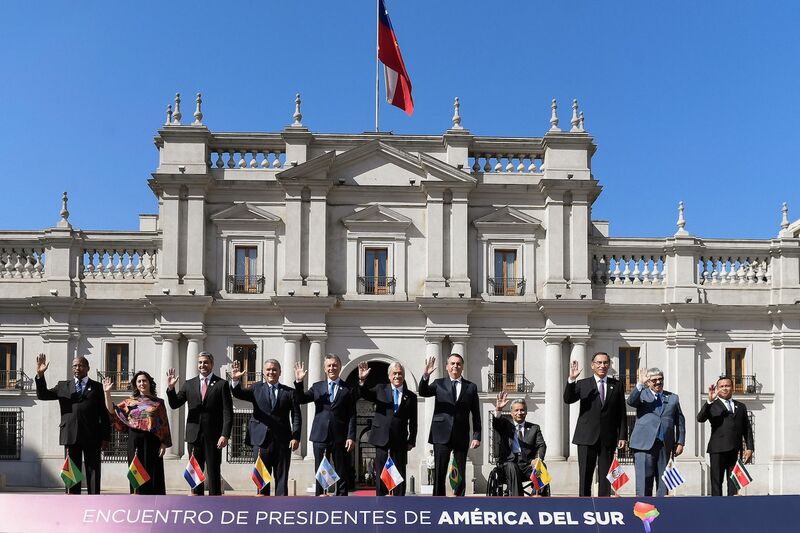 Eleven South American leaders are meeting in Santiago, Chile to talk about cooperation, photo courtesy of Alex Ibanez/Chilean Government. “Unasur is practically extinct today. We cannot admit that countries’ policies remain driven by ideologies, that is all,” said Brazilian President Jair Bolsonaro about the regional bloc which is being substituted. Among the heads of state attending the meeting in Santiago, were the presidents of Brazil, Chile, Argentina, Colombia, Uruguay, Peru, Paraguay, Ecuador, Bolivia, Suriname and Guyana. Chile’s President Sebastian Piñera said on Friday that the objective of the meeting is to create a ‘forum without ideologies’ and discuss economic integration. “We want to create a dialogue forum,” Piñera said at the opening of the meeting in Santiago. “A forum without ideologies, without bureaucracies; frank and direct with democracy and [preservation of] human rights”, concluded the Chilean leader. Eight heads of state signed the Declaration on the Renewal and Strengthening of South American Integration, dubbed the Declaration of Santiago, was signed in Santiago, Chile, by the heads of state of Argentina, Brazil, Chile, Colombia, Ecuador, Guyana, Paraguay and Peru. According to the Declaration of Santiago, the objectives of the bloc will be implemented gradually, and ‘will address integration issues in infrastructure, energy, health, defense, security and crime prevention, natural disaster prevention and management’. “Today was a good day for collaboration, dialogue, understanding and integration of South America. For more than five years, the presidents had not yet had the opportunity to meet to face the problems of the present and take on the challenges of the future,” said Piñera after the signing ceremony.